Rose Cottage in Dingwall, Highland sleeps 2 people. Rose Cottage in Dingwall enjoys a peaceful setting yet is within a mile of all amenities. Situated in a quiet no through road and next to the owner’s home, with views across open countryside, it offers the best of both worlds. 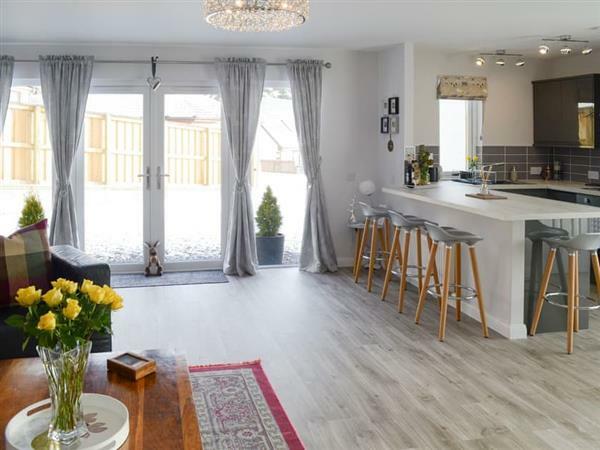 This beautifully presented, detached modern cottage has been furnished and equipped to a very good standard and will appeal to couples looking for a romantic retreat in the heart of the Highlands. The main living area is open plan, and this spacious room is accessed through floor to ceiling patio doors that drink in the light and add to the bright, modern interior. The living room is particularly large, with a superb sofa, plenty of comfortable seating and a 42” wall mounted Smart TV for cosy nights in. The kitchen is exceptionally well-equipped, with built-in units and an attractive breakfast bar. Stairs lead up to the large double bedroom with a king-size bed. This delightful room carries on the theme of roses within the cottage, with pretty soft furnishings and paintings to match. The views from here across the open countryside to the hills beyond are an added feature. Outside there is a private and secluded patio garden with solid wood dining table, as well as a barbecue; ideal for al fresco dining. Rose Cottage is situated just a mile from the thriving Highland town of Dingwall. It has an excellent range of amenities including supermarkets, small shops, cafés, pubs and restaurants. There is a lovely walk direct from the cottage on a country footpath that leads to Tulloch Castle which has a restaurant. A further 10-minute walk takes you to the centre of Dingwall. Just 20 minutes’ drive away lies the Highland capital of Inverness. Here there is a superb variety of restaurants, bars, shops and cafés, as well as museums, art galleries, a theatre and cinemas. Flowing through the centre is the River Ness, with riverside walks and parks to meander and explore. A drive along the old A9 route will take you through to the charming village of Beauly with its historic priory and unusual craft shops. The road finishes at the famous Caledonian Canal on the edge of Inverness. The nearby Black Isle is well worth a visit with its charming fishing villages and unspoilt beaches, the nearest of which is 15 miles away. Boat trips run from here to view the resident bottle-nosed dolphins which frequent these waters. Rose Cottage is ideally located for exploring all the Highlands has to offer and provides a wonderful base to return to. The beach is 15 miles from Rose Cottage in Dingwall. With the shop, pub and restaurant ½ mile from Rose Cottage. 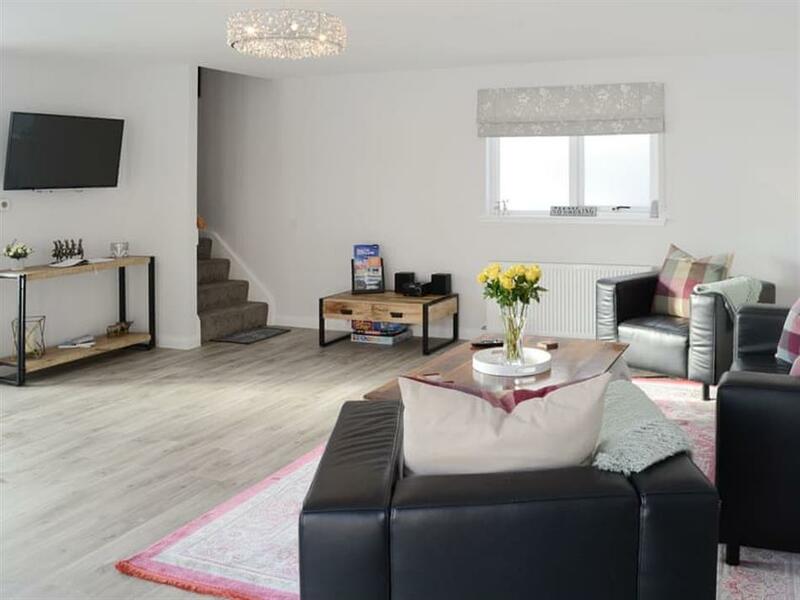 Living area: With 42 Freeview Smart TV. Kitchen area: With breakfast bar, electric cooker, fridge and washer/dryer. Bedroom: With king-size bed and en-suite with double shower cubicle and toilet. Gas central heating, electricity, bed linen, towels and Wi-Fi included. Welcome pack. Use of owner’s freezer. Small enclosed patio with sitting-out area, garden furniture and barbeque. Private parking for 2 cars. No smoking. Holidays at Rose Cottage run from Friday to Friday. Do you want to holiday near Rose Cottage (UK10658), you can see other cottages within 25 miles of Rose Cottage; have a look to find your perfect holiday location.